Chiltern has a tranquil atmosphere where life proceeds at a leisurely pace. Explore the town's heritage, with many buildings retaining their historic authenticity. Interestingly, some twenty-one buildings are registered or owned by the National Trust. 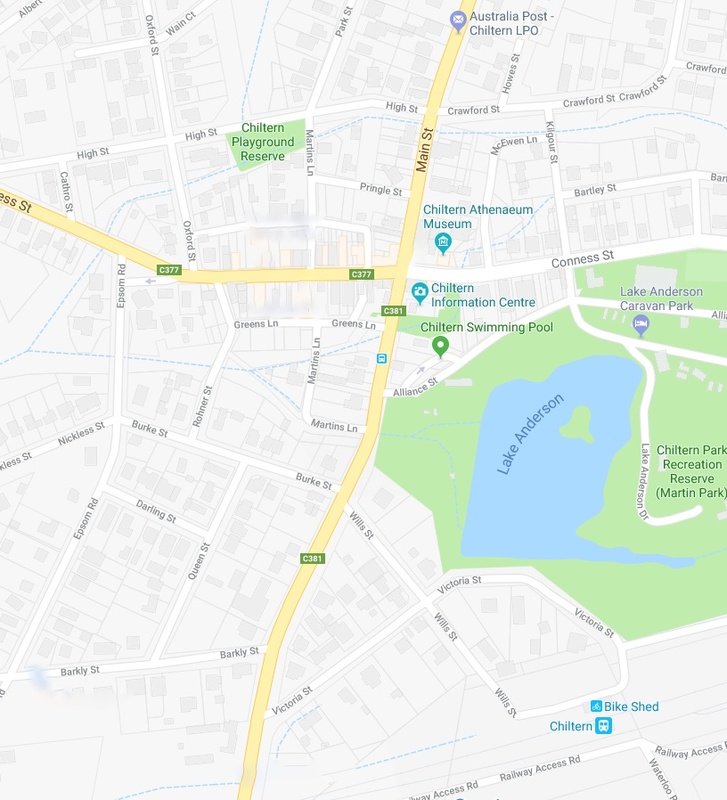 The Chiltern Walk is concentrated on the two main streets in Chiltern - Conness and Main - but also takes in the park, lake and train station. Allow 90 minutes to see all 20 points of interest noted on the map below. There are a number of other walks in and around Chiltern with several featured in the new 'Short Walks with a Story' guidebook. The walks range in distance from 3/4 km to 15 km so whether you are an avid walker or someone who just wants a leisurely stroll, Chiltern has it covered. The Chiltern Walk is number three walk in the guide. Download the new 'Short Walks with a Story' guide here. This building, the third bank premises on the site, was erected in 1935. The cost of the building was 3,000 pounds. A medical dispensary was established at this site in 1859. The present building was erected in 1868 and was maintained as a pharmacy until 1969. The building is now owned by the National Trust with the exterior retained in its original condition. Constructed in 1877-79, it ceased operation in 1943. Built in 1920, as Wain & Hyland Blacksmiths. Formerly Gray's Garage. This double story building was erected in 1870 by James Wilson. In 1890 he purchased Hancock's Drapery over the lane and added this to the hotel. It was delicensed in 1941. This building was erected by John Gilmour in 1890, replacing some of the last of Chiltern's bark-roofed shops. It continued to trade as a grocery store well into the 20th century. "Linden" was erected in 1890 by David McEwen, a pharmacist. 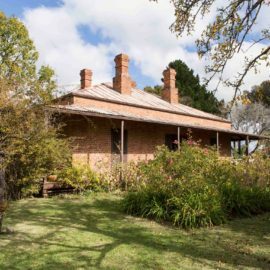 This was the birthplace of his son John, who went on to become Prime Minister of Australia. Built on land set aside as the Police Reserve. Opened 1903 and closed in 2003. Currently Elvery Gallery and Hub 62. The Courthouse was erected in 1865 using a standard Public Works Department Plan. It was used as a courthouse until the 1970s and then as the Council Chambers and Meeting Rooms. Erected in 1863, the Post Office was the first of the government buildings in Chiltern. The front projection was added in 1900. The lock-up was built by the Public Works Department in 1873 and the residence two years later. If only the walls could tell the stories they witnessed! Built in 1866, the building, along with the theatre and adjoining billiard saloon, provide a rare example of the extensive leisure facilities of the gold rush towns. In the courtyard grows a grapevine planted in 1867, the largest in the southern hemisphere. Today operates as The Vine restaurant. Erected in 1866 as the Library, Council Chambers and Town Hall. The Council moved to the office in Main Street in 1937 and the library was relocated in 1970. The museum also contains the works of pioneer and artist Alfred William Eustace. Andrew Kilgour built this residence opposite his blacksmith foundry in the 1870s. At the time it was known as the most handsome house in Chiltern. Later it became the Chiltern Private Hospital. From 1860 to 1910 when Chiltern was a busy mining town, there were at least four foundries in town creating mining tools and implements. With the decline of mining, foundries moved to making agricultural equipment. Created from the subsidence of Alliance Gold Mining operations. It is an ideal place for a picnic and has a wildlife and bird refuge. Owned by the National Trust, the house is the childhood home of authoress Ethel Florence Richardson, who wrote under the pseudonym of Henry Handel Richardson. Her most famous novel, The Getting of Wisdom was first published in 1910 and was made into a movie by Bruce Beresford in 1977. The station complex, including the goods shed, was built in the best public works tradition. The verandah features distinctive cast-iron drinking fountains on its posts. Be careful near the railway tracks. Take in the quiet beauty of Chiltern's parks. Features throughout the area include the fountain, mature trees, and the mullock heap - the only remnant of the town's Alliance Gold Mine. 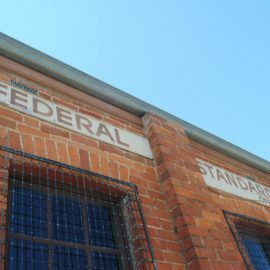 The Federal Standard newspaper was established in 1859 and the building still contains the old printing press and ancillary equipment. Owned by the National Trust. The Chiltern Walk guide is also available from the visitor information centre at 30 Main Street.